We are not alone in this struggle for the re-creation of our own lives and the life of our community. It has long been written and known that those who choose to struggle for the life of the earth and its beings are part of an ageless, pulsating membrane of light that is filled with the lives, hopes, and beatific visions of all who have fought on, held on, loved well, and gone on before us. For this task is too magnificent to be carried by us alone, in our house, in our meeting, in our organization, in our generation, in our lifetime… we are all a part of one another, and we are all part of the intention of the great creator spirit to continue being light and life. Cool, lower 60s, clear, still. Allied Media Conference (AMC) finished, now the real work—the fun work, the painful work, the challenging work—begins: photographing Detroit. This year at the AMC, perhaps like last year’s, ended with a bang and not a whimper. 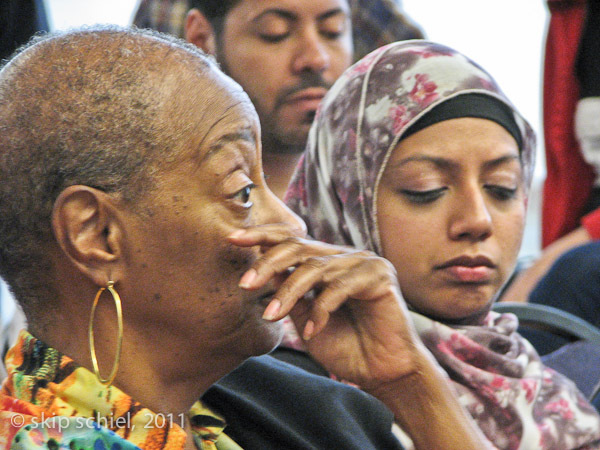 The last workshop I attended, titled Human creativity and the next revolutions, featured brief talks by Grace Lee Boggs, Vincent Harding, and Halim el Dabh. I nearly missed this listing. Only by perusing the catalog during a lunch break did I find it. 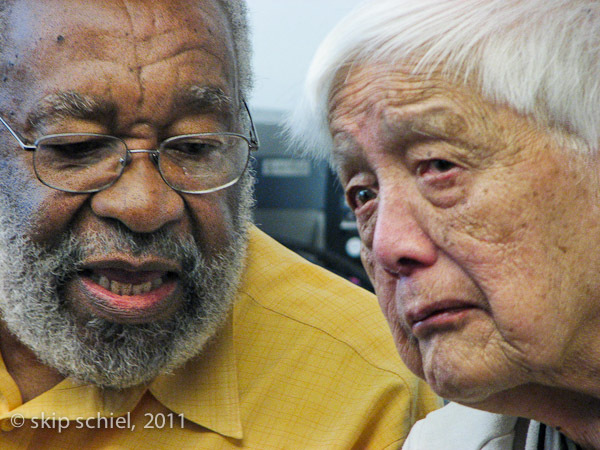 Grace Lee Boggs and Vincent Harding together! Amazing. She (age 96, nearly) spoke about finding the positive in the negative, the yes in the no (much like the Great Turning perhaps that Joanna Macy writes about), the dialectic of thesis-antithesis-synthesis, while not using those terms, crediting Hegel. She applied it to the phenomenon of hope and reconstruction transcending suffering. Out of suffering great works emerge. I believe I first heard about Harding when reading his excellent history of the Black Freedom Movement, There is a river. Later I met him in person at a conference in central Massachusetts and again thru a Buddhist academic center. I remember him beginning his talk by playing Civil Right Movement music. He may have served on the advisory board of the Interfaith Pilgrimage of the Middle Passage, a journey I undertook with many others in 1998 to retrace the African slave trade. 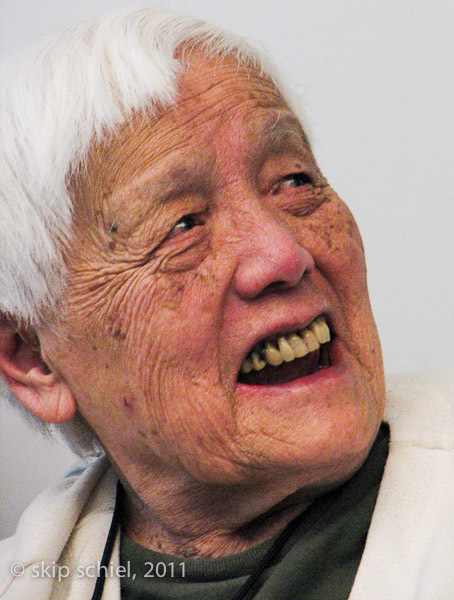 Y told me about Lee Boggs, impressed with her earlier Marxism and support of Malcolm over Martin. In reference to Detroit on the rise I hear about her frequently. I’ve quoted her in one of my presentations about Detroit, words to the effect of let’s make the revolution of values peacefully, step by step, grassroots and beyond, and with strong determination. Vincent (age 81) used stories of others to teach lessons. For instance his main talk hinged on a question a young man had asked in a previous talk, what are the foundational stories of our new democracy? 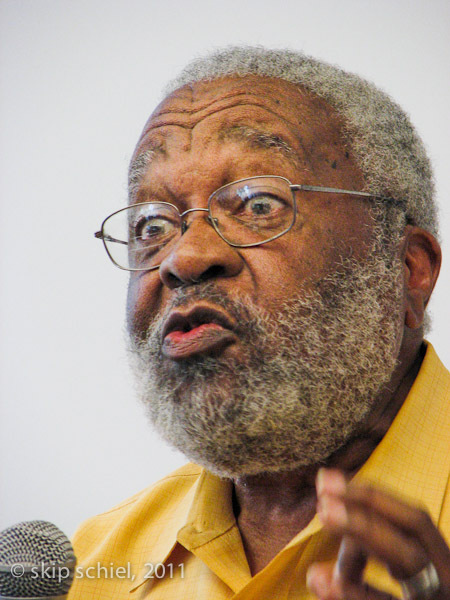 In the discussion following his main talk he referred to someone in the audience who had established porch seminars in Detroit—selecting a porch, often in an impoverished area, on which she then organized a neighborhood discussion about some topic such as urban gardening. This was in response to a question about how to make use of the elders: porch seminars with elders telling their stories. Another story, in answer to the question about when were you discouraged and what did you do, paired with what art work most sustains you, he told about Martin Luther King Jr listening to a blues or country version of “Precious Lord,” then going out on the porch of the Lorraine Motel to ask a blues artist standing in the parking lot (if I have the story correct) to play that music for him later that evening before his talk. Vincent claims these were the last words of MLK before his assassination. Vincent, who had written the first draft of Martin’s Riverside speech criticizing the Vietnam War, ended by leading us in song. All very powerful. The young hip-hop artist woman moderating the panel introduced Halim (age 90) as the Egyptian composer of the first African electronic music, which I suspect is an arguable claim. He was not as lucid and wisdom-laden as the other 2, nor as succinct, but he was joyous and dear. He led us in a song which later became the finale song for the entire conference. I was moved to tears by much of this panel. Luckily I found a seat near the front and had a good camera position. I stilled and movied. Some of what I made I thought my dear friend and companera, Y, might truly appreciate. She among my entire circle would be most likely to appreciate this pairing of key wisdom figures. Will I be able to convey to a lager audience the power of these elders? A side benefit of this last workshop—more accurately a panel discussion with subsequent questions and answers—was honoring the elders. I was not on the panel but I felt fully honored. Then the conclusion of the entire conference. We assembled in the main lobby, sang, beat our hands and feet in rhythm to the lead of Halim, danced sort of, chanted a line about Jan or Feb. 25th which I believe was the date of the Egyptian revolution, and departed. I should also mention 2 other workshops with some interest, Al Sha’ab Yureed (The People Demand), about the new media fostering the Arab Spring. I asked one presenter, Atef Said, an Egyptian in Egypt for part of the revolution, about the importance of nonviolence. He said it varied. Some people defended themselves and their property with clubs. Others were strictly nonviolent. The sense I received was that nonviolence was an operating principle in much of the revolution but not all. 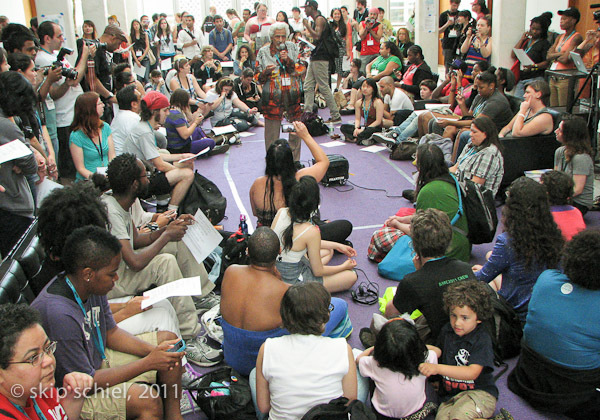 This revolution was not based on nonviolence as much of the US Freedom Movement was. This might have been because there seems to have been no one leader or leadership entity like Dr. King or the Southern Christian Leadership Conference that clearly stood as the leadership. Nadine Naber, in Egypt currently, visited us by Skype and showed what I can only call gibberish as her entry into the world of cyber media. Something called the cyberborg. Hastily thrown together, as she admitted, some sort of incoherent collage. Yesterday morning I attended yet another Palestine/Israel track workshop, New Media to Create the World We Want to See: Let’s End Israel Apartheid, with Kristin Szremski from American Muslims for Palestine, and Andrew Kadi from the Institute for Middle Eastern Understanding. Very interesting about blogs, Facebook (Andrew felt the Gaza Youth Break Out manifesto was dumped from Facebook because of it did not meet the terms of service, however they were applied to this entity and it might have been because they signed up as an individual when they were an organization, they later corrected this), Twitter, websites, and the many ancillary services linking to these. I am midway in understanding and using this new media. Thank god for Islam at Quaker Palestine Youth Program in Gaza who seems very adept at the new social media. An excellent conference as expected. With a few caveats: I met virtually no one, other than the few fellow elders on the van for the opening eco tour. And Dunya, an old Israel-Palestine friend, and former roommate of my daughter’s at Hampshire College, and Kristin, from American Muslims who I met last year. I told her how much I admire the organization’s graphics. I picked up a new assortment. These initial meetings on the eco tour led nowhere. I remet none of them. None of the workshops I attended included any time for personal participant intros, unlike last year when I recall at least a few presenters made this one of the key points. I shirked the opportunity to meet the makers of the movie Road Map to Apartheid, mainly my own reluctance to engage more deeply with them, based rightly or wrongly on what I picked up as their or at least his relative coolness to engagement. I made a decision and feel it might have been a wrong one. Missed opportunity. Filled, satisfying, enlightening, encouraging, inspiring. As hoped for. And now I settle in on one of my main themes: photoing Detroit. Adding to my supreme pleasure this year in Detroit is my bicycle. How I love it, live for it, relish it, can’t wait to hop aboard. All is righted when I mount it. I overcome problems, quell anxieties, relieve pains. Despite my ailing back (again, maybe the mattress) and my failing hands (increasing pain) I am fully alive and young again on my bike. Not alone on my bike—many others bike as well, usually older black men—I roam the hi and bi ways of the city, as free as a crow or eagle. My bike is my partner, my bike is my pet, my bike is my confidant and lover, closest friend in Detroit (other than K and AR), and I will soon give it up to its owner, M.
A dream: I photographed a group of homeless people on the street at a food distribution spot. Then they sang. I joined them to show that I was part of the organization running this program. Later another group went thru some sort of athletic routine, all in close coordination. They were formerly homeless. I ran to photograph them but was intercepted by a man who told me I had no permission to do this. I tried to explain that I intended to show recovery from poverty. Long debate.